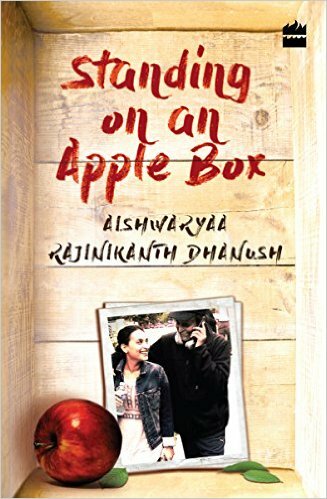 Standing on An Apple Box by Aishwaryaa Rajinikanth Dhanush is the first book by the daughter of Rajinikanth, the legendary superstar. With Standing on An Apple Box, Aishwaryaa Rajinikanth has revealed her own story of being a celebrity kid, making her career choices, her marriage and above all – being a woman in this era. The complete name of the book is Standing on An Apple Box : The Story of A Girl among the Stars. There is a complete length in her book, Standing on An Apple Box, where opens up and lets readers explore her life as Rajinikanth’s daughter. She has mentioned splendidly about her love and raising her kids with Dhanush. The best thing about Standing on An Apple Box by Aishwaryaa Rajinikanth is the way she explains how she fought with herself and found satisfaction in the career of her own choice. Standing on An Apple Box is not only a memoir but a keen insight into the life and difficulties of a woman, and how there are still a hundred reasons to happy in finding one’s own identity. Standing on An Apple Box is all about finding your own place among the stars! Aishwaryaa Rajinikanth Dhanush is a director and classical dancer. She was born in 1982 to legendary actor Rajinikanth. She has also acted and sung in a number of films. Earlier, in 2016, Aishwarya Rajinikanth Dhanush was appointed as a Godwill Ambassador by United Nations Women Organisation. Aishwaryaa received the Kalaimamani award for Dance from the Government of Tamil Nadu. With her memoir, Standing on An Apple Box, Aishwaryaa has made a writing debut in 2016.